I've been working on this one workflow for the past three weeks, which tells me that a) I have no idea what I'm doing b) reading documentation without screenshots is not helping me and c) I really need to re-consider my choice of career field (again). I'm using SharePoint Designer 2013 with a SharePoint 2010 workflow on a document set for use with the SharePoint 2016 on-prem platform. I have an approval workflow set up such that when the user creates a new document set in the document library and uses a "Submit for Approval" dropdown to trigger a workflow, one of three workflows starts. The workflow successfully creates some logs and then starts an approval workflow with a custom task form created in InfoPath 2010 where someone from the first approver group adds in data to additional fields using association columns, then presses the Approve button. The issue I am having is trying to get the outcome value from the task form so that I can determine if they have approved or rejected it. 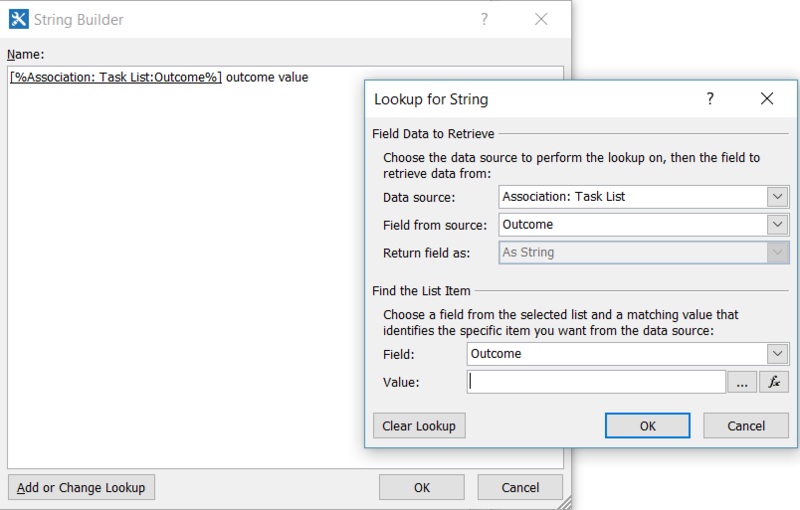 I've modified the name of the original Task Outcomes so as to be able to distinguish it and perform an evaluation based on whether they selected the Approve button (tied to ApprovedByGroup1) or the Reject button (tied to RejectedByGroup1). The intention is to capture the value of the outcome and if the outcome value is ApprovedByGroup1, then send an email to Group2 and start their approval process. If not, reject the action (or eventually have it route back to the originator to have them restart the process). I've tried simply logging the Association Task List - Outcome value to the history log, but am not getting anything. I have a feeling it is because I simply don't understand (and am unable to find documentation) on the proper use of the "Find the List Item" that it forces me to use. How do I get the outcome value of either ApprovedByGroup1 or RejectedByGroup1 so that I can appropriately set the workflow status and determine whether to route it to the second group of approvers? Screenshots would be extremely helpful, as I'm going in circles trying to figure out how to apply what I've read on here. Browse other questions tagged workflow infopath approval designer or ask your own question.